For many young professionals trying to succeed in the big cities, transportation is an important factor in their mobility. The relative ease of public transportation enables these working millennials to travel without much stress. Yet the recent infrastructure plan released last week might just prove to be stressful for taxpaying millennials in metropolitan areas. To give a rundown of the infrastructure plan, the Trump administration proposes the $200 billion plan would act as an incentive for state and local governments to start their own funding towards roads, bridges, and other public projects. They encourage efforts such as increasing user fees (i.e. tolls), tax increases and partnerships with private investors. Over the next decade, an amount of $20 billion would be allocated annually to projects that garner a sufficient amount of funding on behalf of states and local governments. Part of the plan is to lower regulations for state and local governments to seek federal approval for their infrastructure projects. The administration also proposes to have just one federal agency responsible for the permissions for public works rather than have that responsibility be spread throughout multiple agencies. The administration believes that through state and local funding efforts and their 20 percent contribution, the infrastructure plan would see a return of $1.5 trillion by the time the ten years pass. However, there are a few specifications associated with the federal support. For one, only half of the $200 billion would be put towards the grant application process. Additionally, $50 billion would be used exclusively for rural projects since those areas have trouble earning revenue from tolls or user fees and thus have less potential of receiving private financing. Of the remaining amount, $20 billion would be put towards projects deemed innovative and have (assumedly costly) characteristics that make it unfavorable with private investment. Furthermore, the infrastructure plan may experience difficulties with its own funding in terms of availability. On the same day the infrastructure plan was released, the White House also revealed its budget plan for the next fiscal year. In it, they propose several budget cuts to federal programs that once added together could provide the necessary $20 billion per year to support the infrastructure plan. One of the proposals is cutting funding to the Department of Transportation by 19 percent, which could prove difficult for states and cities that look to the department for grant assistance for transit and other public projects. One must also consider the spending bills that have recently been passed. It is already projected that the two-year spending bill of $300 billion and the coming tax overhaul will increase the deficit to trillions of dollars. Hence, Congress is bound to be hesitant on any additional spending or any reallocations that would take away from the agreed amounts for other governments programs. The rise in deficit and the reformed tax laws will make borrowing money and generating revenue difficult for state and city governments. The tax overhaul limits deductions for state and local taxes, which makes raising state and local taxes less than ideal to increase revenue. Though given these pressures by the federal government’s budget cuts, the more local governments will have to limit their public projects to reserve funding for only the most pressing projects. Another method these governments would need to implement is raising the user fees for some of their infrastructure. One example of this is increasing the tolls on roads and highways. This has the potential to appeal to private infrastructure investors who may see the profit from entering private-public partnerships with their local government. Another suggestion made to state and local governments came from the Chamber of Commerce. They suggested a raise in the federal gas tax by 5 cents per year over five years, for a total increase of 25 cents. The current federal per-gallon taxes on gasoline and diesel are 18.4 cents and 24.4, respectively, and have remained unchanged since 1993. These fuel taxes also go towards the Highway Trust Fund, which provides much of federal transportation funding to the states but has had trouble staying funded. The Chamber of Commerce stated that when indexing the rate to inflation, the raised gas tax would cost an average American an additional $9 a month and could potentially raise a total of $394 billion in the next decade. 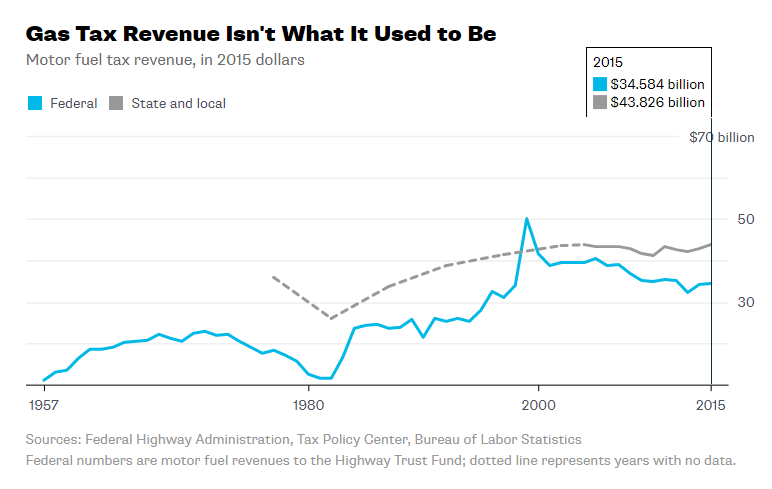 Though, this may also prove problematic as the revenue from gas tax has had limited growth for the past several years. From 2007 to 2013, gasoline consumption decreased and though it eventually picked back up, there are still less people driving than there were back in 2005. A key reason for the decrease corresponds with the innovations in better fuel mileage seen in newer car models. New cars with better fuel efficiency prove to be a better long-term investment as its more cost efficient to travel a fair amount while consuming less gas and spending less on gas taxes. However, this could all prove especially challenging for taxpayers in cities. Ordinarily, metropolitan areas have a higher population density found when compared to the rest of their state. These areas also have larger government expenditures to keep pace with the demands of having a heavily condensed population. As mentioned before, only half of the proposed $200 billion in the infrastructure plan will go to non-rural state and local governments through a grant process. Some states with the highest expenditures and outstanding debt with the most populated metropolitan areas are California, New York, Florida and Illinois. Despite it’s shortfalls, the infrastructure plan does provide substantial benefits to the public. The aim of the plan is to concentrate on dilapidated public works and new public projects to meet the current needs for transportation expansion, such as increasing highways, improving bridges and creating tunnels, to name a few. Once funding is achieved the plan would most likely steer more jobs to the construction industry. Although the Trump Administration puts most of the responsibility surrounding infrastructure funding on local governments, it’s residents are the ones who’ll bear it. This is especially true in metropolitan areas where population growth intensifies the need for infrastructure projects. While the government’s heart is in the right place, their infrastructure plan shows signs that it will further distress local governments and increase the cost of living.